What Does Deuteronomy 6:5 Mean? At the end of their long, 40-year trek in the wilderness, Moses repeated the words of the covenant that God made with Israel, which began: hear O Israel, you shall love the Lord your God with all your heart and with all your soul and with all your might. But this appears to be an impossible command for fallen man to attain. We are born dead in sin and at enmity with God. 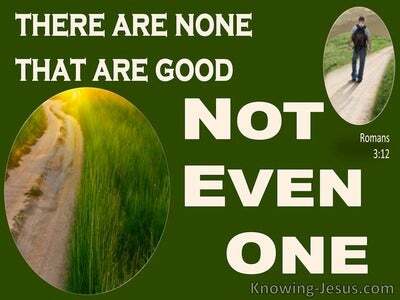 As members of a fallen race we have all sinned, and all have fallen far short of the goodness and perfection of God. God alone is perfect.. so He alone is able to fulfil the command to love with every fibre of His being - for God alone is love. It is humanly impossible to love the Lord in the way He commands and to love others with that same godly love. No one can love God every moment of the day, and in every circumstance of life. As members of humanity we are bound by our fallen nature, to fall short of His perfection. Irrespective of the sin we commit on a daily basis, we break this particular command continuously.. for it is not humanly possible to love God with all our heart. Indeed, it is impossible to love as Christ loved us - which was the new commandment He gave to each member of the Christian Church. Once we understand our inability to obey God's commands, and admit our spiritual bankruptcy, we are in a position to admit that we are sinners in need of a Saviour. 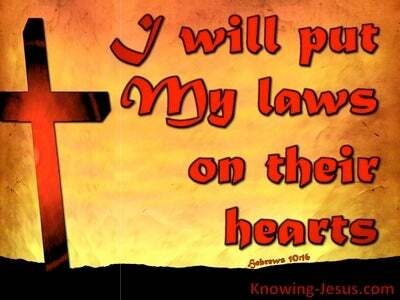 Indeed, this was the original point of God's holy law. It was given as a schoolmaster to teach us about Christ. It was a signpost bring us to the foot of the cross. 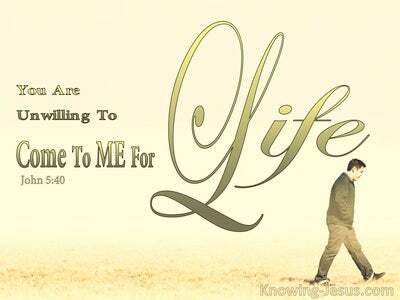 Throughout His earthly life, Jesus was seeking to expose this deadly, sinful flaw in mankind's character. Christ was seeking to show the immensity of our sin against the goodness of God, so that He could provide the message of salvation - by grace through faith. It is by grace through faith in the death, burial and resurrection of the Lord Jesus Christ, that we.. who are members of His body, have been cleansed from our sin, been made children of God and been clothed in the righteousness of Christ, Himself. Only the perfect Man - the Lord Christ Jesus, was good enough to pay the enormous price of sin. Only He was capable of loving God with a perfect love. Only in Christ can we be forgiven of sin and only in Him can we be imputed with Christ's nature and love as He loved us. Only in the power of Christ can we love the Lord our God with all our heart. 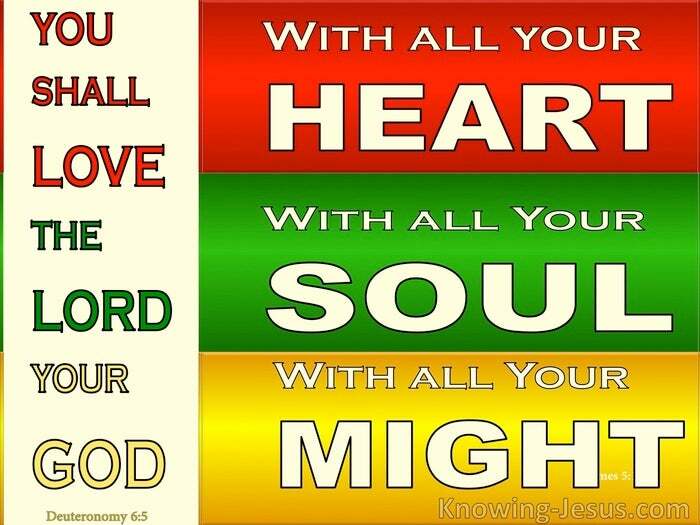 Only in Him can we love God with all our soul and with all our might and with all our mind and with all our strength. For it is only as the very love of Christ, flows into the heart, that has been washed and cleaned by His sacrificial blood.. that we can love with a Christ-like love. It is only as we abide in Him and continue to be filled with His Spirit of love - that the very love of God, is poured into our heart from His Father-heart of love. Only as we are filled with His supernatural love from above, are we able reciprocate that love. 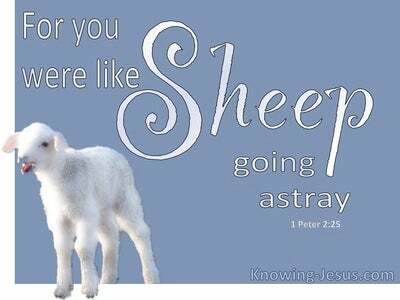 Only as we walk in spirit and truth, can we love the Lord our God with all our heart and mind and soul and strength - and thus, become a channel of His love to those that are hurting. 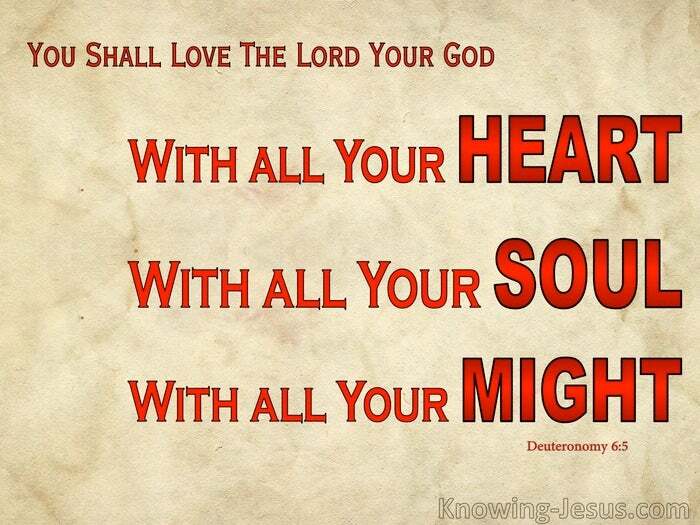 To love the Lord our God with a Christ-like love, is only possible as His love is continuously poured into our heart. The more we imbibe Him, the deeper our love for Him will become. Indeed, as we witness the faithfulness of God in the difficult struggles of life, and experience His tender mercies in the painful circumstances, through which we must inevitably pass, our love for God can only deepen and strengthen - as we grow in grace and in a knowledge of Him. May our heart-cry become: that I may love the Lord my God, with every fibre of my being.. as I die to my own self-interest, and live for Him alone. Heavenly Father, what amazing grace You have shown to me, and the entire human race, that Your love for us is so great.. that You would send Your only begotten, Son to die for our sin. No matter what it takes, I pray that I may learn to love You with all my heart, and soul, and mind, and strength - and with every fibre of my being, knowing, that it is only as I die to self and live for Christ, that Your love may be manifested in me. Thank You in Jesus name, AMEN.